Use of a novel approach to analyzing brain structure that focuses on the shape rather than the size of particular features may allow identification of individuals in early presymptomatic stages of Alzheimer's disease. 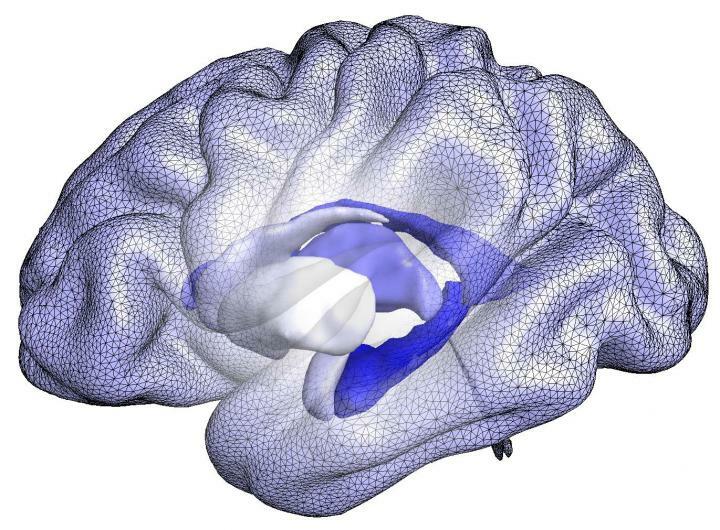 A team of Massachusetts General Hospital (MGH) investigators using advanced computational tools to analyze data from standard MRI scans report that individuals with Alzheimer's disease, including those diagnosed partway through a multi-year study, had greater levels of asymmetry – differences in shape between the left and right sides of the brain – of key brain structures. Their study has been published online in the journal Brain. "Our results show for the first time that asymmetry of the hippocampus and amygdala increases with disease severity, above and beyond age-associated effects," says Christian Wachinger, PhD, formerly with the Martinos Center for Biomedical Imaging at MGH, the lead author of the report. "By studying the progression of asymmetry from mild cognitive impairment to dementia, we demonstrated that greater asymmetry in those and a few other structures can predict disease progression and could be a biomarker allowing early detection of dementia." Wachinger is part of a team led by Martin Reuter, PhD, of the Martinos Center, that developed BrainPrint, a computer-aided system for representing the whole brain based on the shapes rather than the size or volume of structures. Originally described in a 2015 article in NeuroImage, BrainPrint appears to be as accurate as a fingerprint in distinguishing among individuals. In a recent paper in the same journal, Wachinger and Reuter demonstrated the use of BrainPrint for automated diagnosis of Alzheimer's disease. The current study used BrainPrint to analyze structural asymmetries in a series of MR images of almost 700 participants in the National Institute of Health-sponsored Alzheimer's Disease Neuroimaging Initiative (ADNI). Participation in that study involves MR brain imaging taken upon enrollment and repeated every 6 to 12 months, along with cognitive and genetic testing; and the MGH study analyzed data from ADNI participants with at least three MRI scans. Participants were divided into four groups: those diagnosed with probable Alzheimer's when entering the study, healthy controls with no sign of dementia, individuals with mild cognitive impairment that remained stable over the two to three years for which scans were available, and those with mild cognitive impairment that progressed to Alzheimer's disease during the study. BrainPrint analysis of the data revealed that initial, between-hemisphere differences in the shapes of the hippocampus and amygdala – structures known to be sites of neurodegeneration in Alzheimer's disease – were highest in individuals with dementia and lowest in healthy controls. Among those originally classified with mild cognitive impairment, baseline asymmetry was higher in those that progressed to Alzheimer's dementia and became even greater as symptoms developed. Increased asymmetry was also associated with poorer cognitive test scores and with increased cortical atrophy. The senior author of the Brain paper, Reuter explains, "Several studies have indicated that Alzheimer's has different effects in different sub-structures of the hippocampus and amygdala. Since the shape descriptors of BrainPrint are more sensitive to subtle changes within a structure than are standard volume-based measures, they are better suited to quantify early disease effects and predict future progression, which opens up new research directions into the mechanisms that cause these asymmetries. For example, in addition to asymmetric distribution of amyloid beta, which has been reported, the differences could reflect disease subtypes that affect hemispheres differently." Now a professor of Neurobiological Research in the Department of Child and Adolescent Psychiatry, Psychosomatics, and Psychotherapy at Ludwig Maximilian University of Munich, Wachinger adds, "In collaboration with colleagues at the Martinos Center, we are planning further exploration of the relationship between shape asymmetries and established Alzheimer's disease biomarkers to better understand the underlying biological mechanisms. Differentiating between those with stable mild cognitive impairment and those who will progress to Alzheimer's is of great clinical relevance, as it could help select individuals appropriate for clinical trials of disease-modifying therapies." Reuter is an assistant professor of Radiology and of Neurology at Harvard Medical School and director of the Laboratory for Computational Longitudinal Neuroimaging at the Martinos Center. He also holds a research affiliation at the Massachusetts Institute of Technology. Additional co-authors of the Brain paper are David Salat, PhD, Martinos Center, and Michael Weiner, MD, University of California, San Francisco. Support for the study includes National Institutes of Health grant 1K25CA181632, Massachusetts Alzheimer's Disease Research Center grant 5P50AG005134, and grants from the Humboldt Foundation, MGH Neurology Clinical Trials Unit, the Harvard NeuroDiscovery Center, and the Genentech Foundation.